How do we create a more intimate economy? 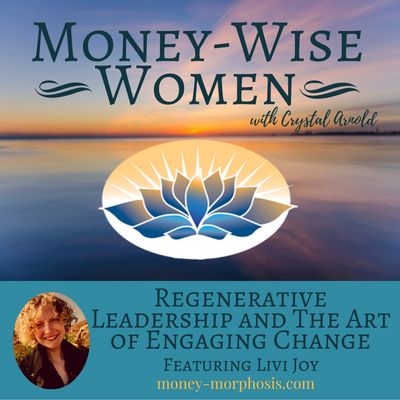 “Money-Wise Women” guest Livi Joy guides us to do just this. Listen in above for deeper insight into your cash. When you dare to explore your relationship with money, treasures are discovered. Livi is an ambassador of courageous truths. Before her current work as a systems strategist, workshop facilitator, speaker, and leader, she was a psychotherapist that worked primarily with kids in foster care. She served to catalyze greater emotional intelligence in the children, the qualities of resilience that were required to respond to instead of react to adverse conditions. We share the profound recognition that humans have more capacity than we are accessing now through our current economic system. Livi describes innovative projects and invitations for developing our potential in times of transition. Her skills with systems-level design, group facilitation, and interpersonal dynamics are quite unique. Using permaculture ethics and regenerative development principles, Livi is working with Liora Adler, co-founder of Gaia University, to develop regenerative agricultural and economic systems beginning with a mission driven, cooperatively structured, water-wise almond tree nursery, orchard demonstration site, and consulting services in California. This is why our current economic system with the promise of purely monetary interest is so destructive. The economy is siphoning value from the environmental and social arenas, and the financial sector has ballooned in recent years to an unsustainable level. Livi explains the implications of this cannibalistic system of compounding interest and the reasons why you should care about things like the public-banking movement. North Dakota is not only the home to a growing community of natural resource protectors at Standing Rock, it is also home to the only state-owned bank in the country. Livi served as one of the first staff of the Public Banking Institute. Livi and I share a similar passion about understanding both inner and systemic transformation. We discuss the myth of barter, from an anthropological perspective on debt and the history of money. We both are passionate about empowering individuals and entities to respond with more agility to changing circumstances. Purpose-driven sovereign individuals can collectively engage to form organizations that can grow with coherent synergy toward larger goals. How do we invite our own genius to come forth through the group field that welcomes everyone to make a valuable contribution? Whether a mother, farmer, or entrepreneur, your listening in to our full conversation will create wealth for you. What does it take to embody evolutionary feminine leadership skills for organizing and facilitating with grace during these transition times? Imagine top-down models that rely on adherence to authority; now, turn them over like turning over a compost pile. Allow the relationships that serve our essence to keep us connected like mycilia. Fertilize the soil supporting our interdependent sprouts by offering our unique genius. We are cultivating the seeds of our visions and projects that grow from this interconnected web.